Launched by the new CMU first-year robotics grad students and Robot Census Committee (RCC) August 29, 2010. We’ve passed 500 robots!! Oh my goodness! Twitter updates: @robotcensus. “Data gathering for the U.S. 2010 Census may be finished, but it has just begun for the Robot Census 2010. Heather Knight, a first-year PhD student in the Robotics Institute, has launched the unprecedented effort to count every robot residing in Carnegie Mellon University’s laboratories. The idea occurred to Knight and her fellow first-years after listening to faculty presentations during this term’s grad student immigration course. 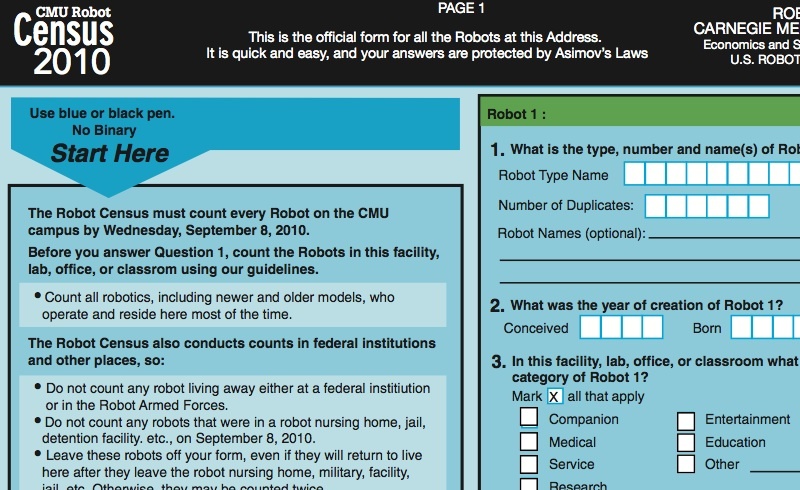 “As much as we’re here for the professors,” she explained, “we’re also here for the robots.” With no full accounting available of CMU robots – much less a list of the coolest robots with the wackiest names — the obvious next step was a census.